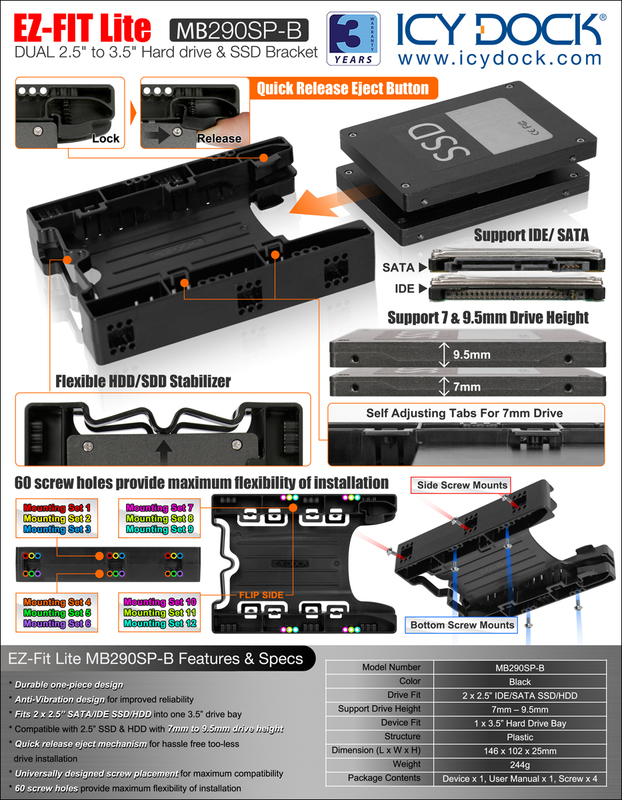 The EZ-Fit Lite MB290SP-B is a great choice if you’re looking to install 1 or 2 SSDs/2.5” HDDs into a single 3.5” bay. If you’re looking for storage density, compatibility, flexibility, and durability without the hassle of a complicated installation, go with the EZ-Fit Lite MB290SP-B. It’s never been easier to effortlessly install 2.5” drives in a system. We, IcyDock, put a lot of thought into the design to fulfill the needs of our customers, whether they’re building Home Theater Systems (HTPC), Gaming PCs, or Mini-IPX systems. Our EZ-Fit Lite MB290SP-B certainly doesn’t disappoint.